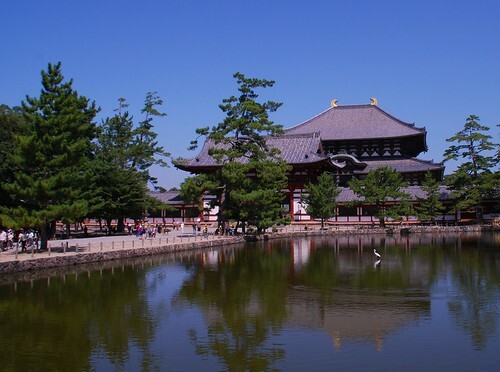 Tōdai-ji Temple, originally uploaded by ZackTwin. I went Tōdai-ji temple with my parents alone as my sister didn’t come with us. The main reason she didn’t’ come with us is to save the cost. You know what; the transportation cost in Japan is very high especially if you are taking Shinkansen (bullet train). We bought one week unlimited ride tickets, called JR Rail Pass, from Singapore, which cost about S$420 at that time. So we can take unlimited ride to any JR trains, Buses or even Ferry with that pass. Oh yeah, we exchanged the pass with the ticket in Tokyo just before taking first Shinkansen. Ok, back to them temple. There are many deer roaming freely around the temple. They are not afraid of people but my mom was afraid of them. We can buy a stack of cookies to feed deer. You have to be careful when you feed them because deer can be very aggressive. I didn’t have to go near to them to feed. They surrounded me once they saw me buying cookies. They even pulled my backpack from behind while I was waiting for my change. It was a bit scary even for me. While I was feeding one of them, another one will be trying to get cookies. I had to quickly feed and run away :D . They are very smart, they didn’t follow me because they know that I don’t have any more cookies for them.